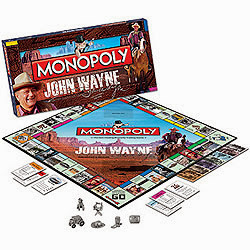 Your place to locate and buy John Wayne Collectable items. Spend each and every day with your favorite cowboy, John Wayne. This calendar has color images of John and a large grid for each month with space to write in your appointments and things to be accomplished. This calendar is printed in the USA. This is a 16 month calendar, so transitioning from 2018 to 2019 should be easy. There is also a discount if you purchase more than one calendar at a time. 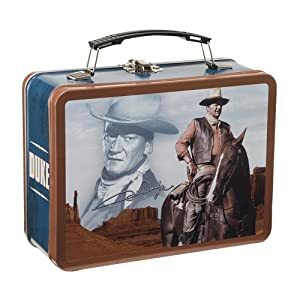 This collectible comes with a hard shell case featuring an image of John Wayne. The collectible knife has two stainless steel blades, with the primary blade having an etching of John Wayne's replica signature. The knife handle has a dark red bone inlay and nickel bolsters. Also there is a "JW" inlay shield. The Duke knew that life's most-cherished memories are often made around the table, over plates of home-cooked food. Collection includes over 100 inspired recipes and tips for every meal from breakfast to dessert. Tasty offerings from the Duke's kitchen to yours include Fried Chicken, Blueberry Pancakes, Barbecue Bean Chili, and Pumpkin-Walnut Cake! Includes an introduction by his son Ethan, plus photos of Duke and his family, as well as stories from family and friends about the man they remember. This softcover cookbook has 252 pages. John Wayne, "The Duke" would have loved this! This neoprene bottle holder with zipper keeps your beer chilled so every sip is as cool as the first. With the classic image of John, there is a classic "A Man's Gotta Do" quote and Western scene in the background of the front and back. This 100% polyester throw is super soft. It is just perfect to cuddle up with on a cold night while watch your favorite John Wayne movie on TV or from DVD. It can also be used as a wall hanging to become the focal point of your room. This throw has a double sided design and is 50 inches by 60 inches. It is machine wash and dry. 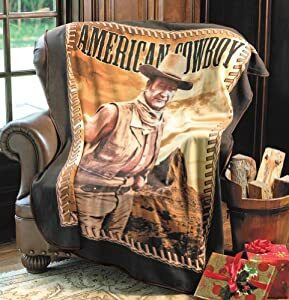 This cozy woven throw has a hand printed design of John Wayne in front of a Western landscape. It can be used as an accent to a bed, chair, or other piece of furniture or it could be used as a wall hanging. The throw is 58 inches by 36 inches and is a 60/40 cotton/poly blend. It is machine wash and dry. Click on image to purchase this collectible. John Wayne was the quintessential American movie star. He was a flag-waving patriot who virtually bled red, white & blue! The flag quote is printed under a stylized, intentionally-distressed portrait of John on the back of a navy blue 100% cotton T-shirt. There is a small logo on the chest. The true persona of this legendary movie star is revealed through this exclusive look inside "The Duke's" archives! This scrapbook-style book is brimming with mementos of John Wayne's life: the football star at USC (University of Southern California), as a film star with leading ladies and fellow actors; the devoted father with his children, and the patriot with Presidents and members of the US Armed Forces. This book contains over 200 photos, some in black & white and some in color of John both on and off screen. Some are of him in costume for a movie role, others are from personal moments. Also, there are photos of awards and metals. This hardcover book has 272 pages. This travel tumbler features double-wall construction with gleaming stainless steel outer shell and food-safe inner cup. It also has a rubber non-skid bottom, and plastic sipping lid. This tumbler holds 18 ounces. Hand wash only. Do not use in the microwave. There is a discounted price when two or more mugs are purchased. 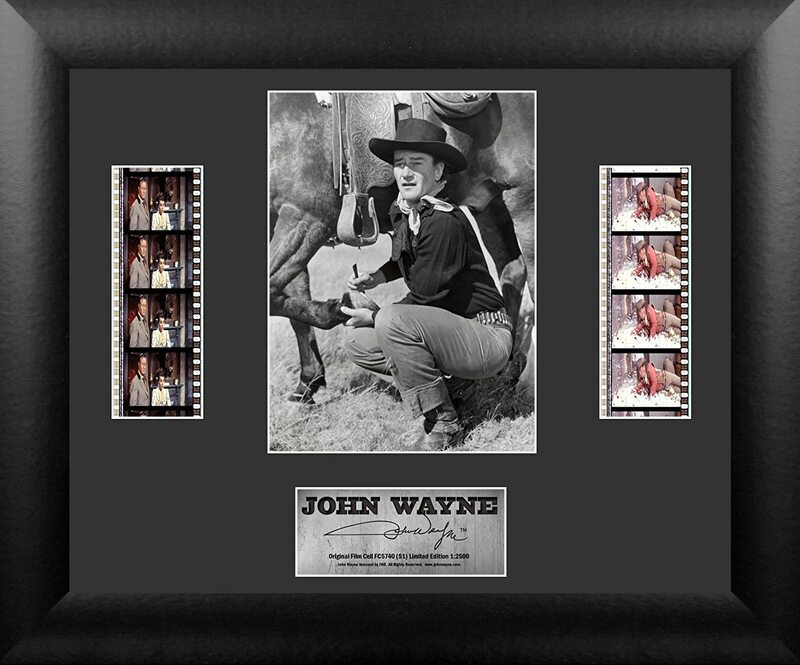 In tribute to the top box-office draw for 3 decades, this limited-edition 6-coin set represents some of The Duke's best work: Red River, Stagecoach, True Grit, The Quiet Man, They Were Expendable, and Hondo. These Iowa state quarters (his birthplace) are layered in 24-kt. gold and are enhanced with colorized images from the movies. These are genuine legal-tender coins and are encased in an acrylic capsule, and the set includes a Certificate of Authenticity assuring its collector-edition status. John Wayne played many roles, including roles off the screen such as dutiful father, loyal friend, unwavering patriot, and part time politician. And you can get his point of view on these things through his letters to his fans, his friends, his family members and even some American troops. You can read his quotes, his first hand stories, and his anecdotes shared by those people closest to him. The book includes an introduction by his son (Ethan Wayne) and never before seen photos from the family archives. This hardcover book is 208 pages. Commemorative Iowa state quarters, six to be exact, with each one of them layered in 24 karat gold. There is also a colorized image on each of the quarters. Each of the quarters has a portrait of "The Duke" from his roles in "Fort Apache", "Chism", "The Conqueror", "Jet Pilot", "The Longest Day", and "The Camancheros". Yes, the are legal tender, they are encased in premium coin capsules, and there is a Certificate of Authenticity. The ultimate in Western wear, this cowboy hat is in the same style as the one wore by "The Duke" himself. This felt hat is crushable and springs back into shape.&nbsp It is in a nuetral "silver belly" color, with burnishing in all the correct places. It has that well-wore look. It has a four inch crown and a three and a half inch brim. It is currently available in four sizes. This dispenser is made of sturdy plastic with chrome accents. One simple twist and the dispenser delivers one toothpick for the user. 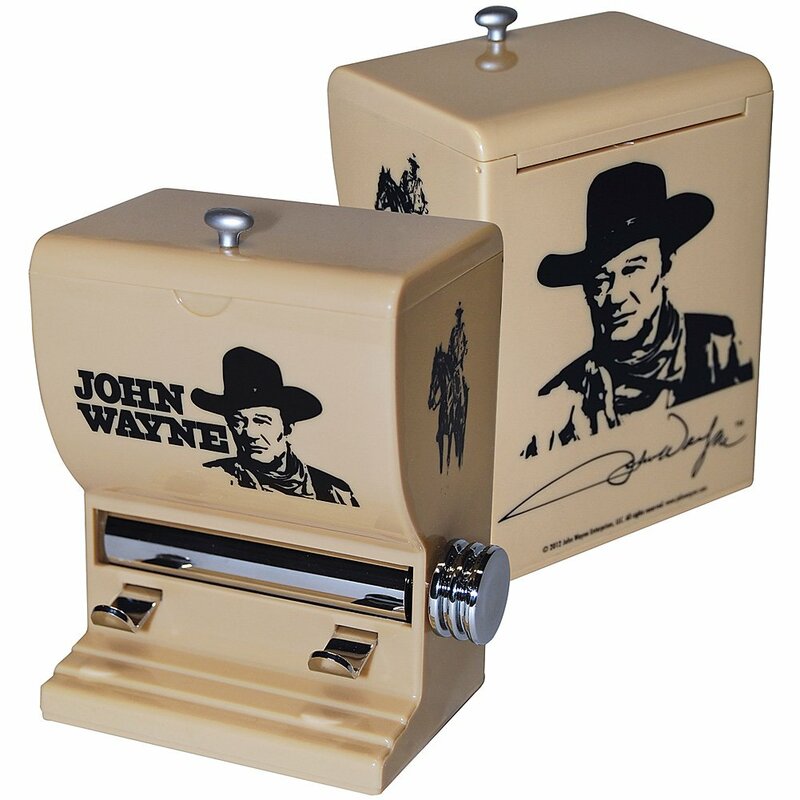 The dispenser has images of "The Duke" printed on it. The dispenser includes a starter set of toothpicks to hold you over until you can restock from the store. The dispenser is 3 inches by 4 inches by 2 and a quarter inches. Even if you are a morning person, sometimes you just got to get a cup of coffee in ya. This mug holds an 18 ounces of coffee (or your other favorite beverage) and has a full 360 graphic with an Old West theme that wraps around the mug. The mug is microwave safe, but must be hand washed. It is time for a real MAN'S drink! This tin contains eight ounces of bacon flovored hot chocolate. 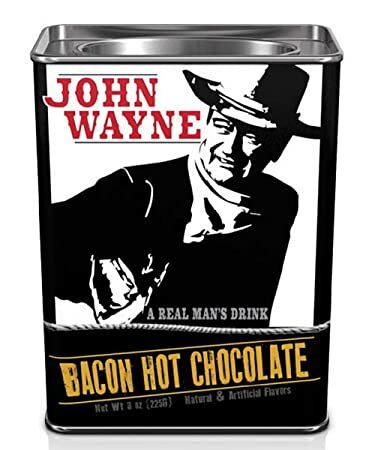 This is a great item for a chocolate fan, a bacon fan, or a fan of John Wayne. 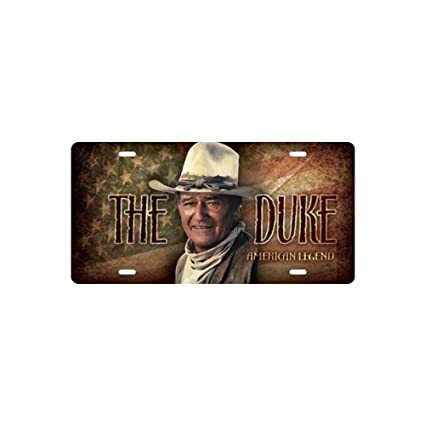 The cowboy is one of the most recognizable roles for The Duke. This T-Shirt is printed on the front using a sublimated ink process. This 100% polyester shirt holds its color for wash after wash. This one of a kind printing process also has inherent random spots of missing ink and slight wrinkles, making each shirt unique. This shirt is imported. Two decks of special edition playing cards. 52 different images of The Duke from various film roles in each deck of cards. Both decks can be stored in the re-usable keepsake tin. The tin measures 5.5" x 4" x 1.75". This is a limited edition production, with a run of 2500 copies. This presentation is in a 13 by 11 inch frame, and includes real film from the movie. This officially licensed product has an acrylic front and back to display the film. 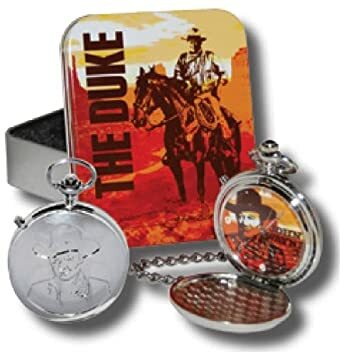 This talking analog pocket watch comes with a collectible storage tin and an actual recording of John Wayne's voice. This storage tin is 1/2 inch by 1 3/4 inch by 1 3/4 inch. 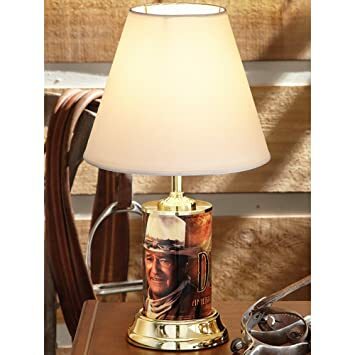 The base of this beautiful table lamp is made from a wrap around license plate with an image of "The Duke". The base also has polished brass tone aluminum as the top of the base and at the bottom. This lamp uses a maximum 60 watt bulb (not included). it has a six and a half foot cord (UL®-listed). The shade is textured vinyl in a neutral color. Over the decades, John Wayne created an on-screen persona of a tough cowboy and war hero. Off-screen, John gained recognition as a patriotic icon, something he took very seriously. 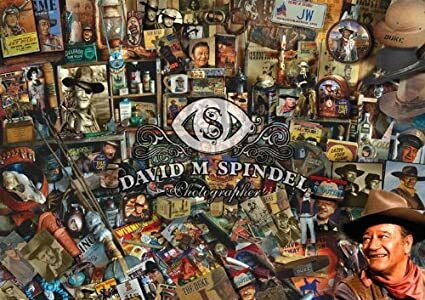 This book of three hundred full color photographs takes you through his career from when he had his breakthrough role in "Stagecoach" to his Oscar-winning performance in "True Grit". The book is loaded with quotes from John himself and many of his loved ones; each providing insight to his on-screen and off-screen life. This hardcover book has 540 pages. 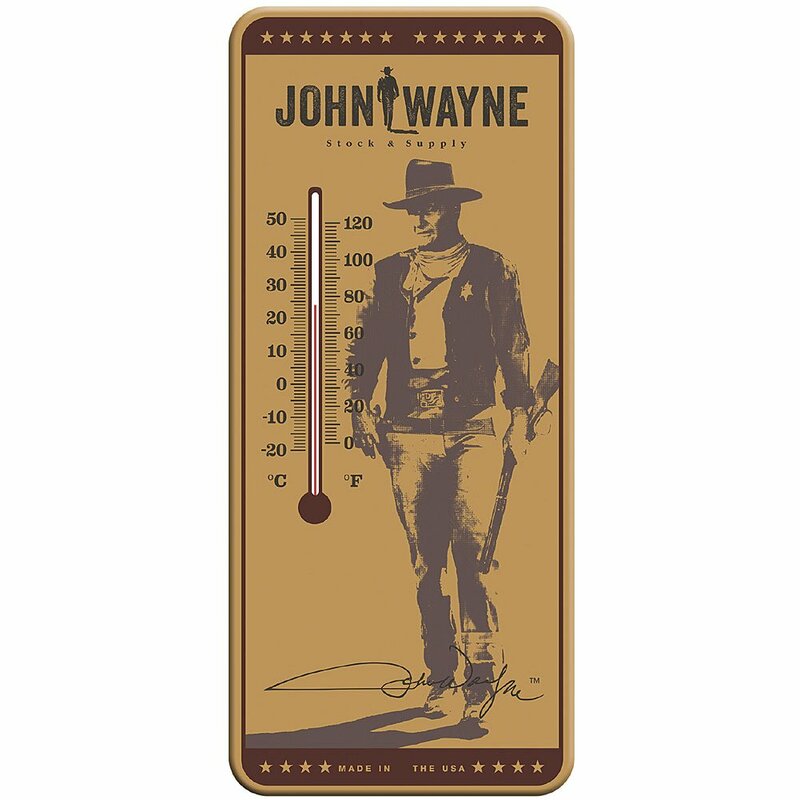 This thermometer is both good looking and made of tough stock, matching the characters the legendary John Wayne portrayed. The thermometer is made from embossed steel and is designed for wall mounting; it has both Fahrenheit and Celsius temperature readings. It has predrilled holes for both indoor and outdoor mounting. Proudly made in the USA. Size: 7" x 16". Legendary movie actor was a true American hero in real life, too! 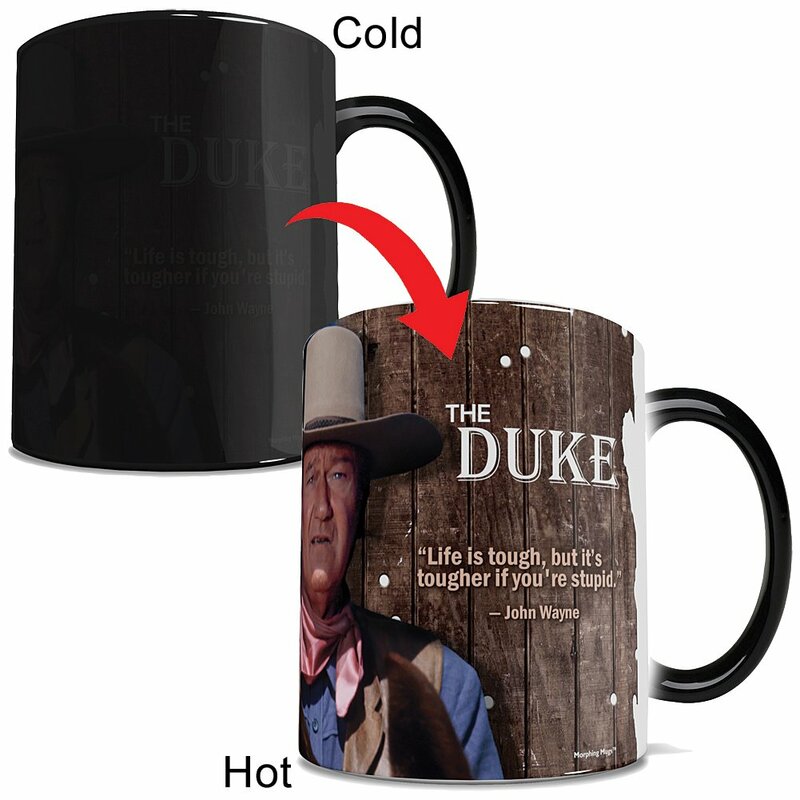 When hot liquid is added, the heat-activated mug morphs from black to reveal a hidden image of The Duke and one of his memorable movie quotes, "Life is tough, but it's tougher if you're stupid." Ceramic; 11 ounces. US made. Not for dishwasher or microwave. Remembering The Duke, his many roles, and all that he stood for, this 1000-piece puzzle depicts a cherished collection that any Duke fan would be proud to own. Made from recycled materials in the USA. 19.25"x 26.75". WARNING: Choking Hazard - small parts. Not for children under 3 yrs. Ultimately, movie actor John Wayne became the same as his screen persona of an all-American patriot and hero. This three disc collection has four documentaries, contains interviews, rare television and film clips, and more. It also has the comedy "McLiintock" with John co-starring with Maureen O'Hara. Portions of this collection are in black and white, other portions in color. The entire collection has a run time of 7.5 hours. 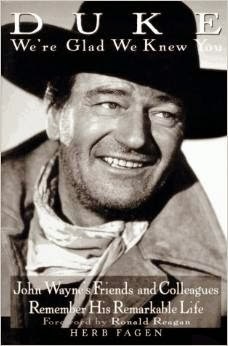 This 278 page softcover book reveals John Wayne as the remarkable and inspiring man that he was. This tribute is candid, funny, and moving. His friends and colleagues who worked, played, drank, and fought with him remember The Duke through photos and telling anecdotes. The book is an excellent way to learn of his larger than life personality. Authorized account reveals the man behind the screen legend. Glimpse the archives of his childhood and college years, his early days in Hollywood, the westerns & war films, his support of the US troops and rise as a political figure; discover his relationships with business associates, friends, and family, and other milestones. Full-color snapshots, film stills & movie posters, pull-out facsimiles of personal letters & telegrams, plus excerpts from his unfinished memoir provide new insight into the beloved star's life. 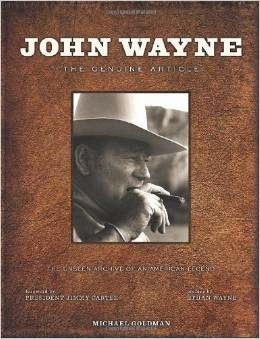 With preface by his son Ethan, and a foreword by former President Jimmy Carter, a self-proclaimed fan of The Duke. Hardcover; 160 pages. Video/DVD, books, and audio products may be returned in exchange for the same title only. Return to the glorious days when cowboys were king and the west was still wild! 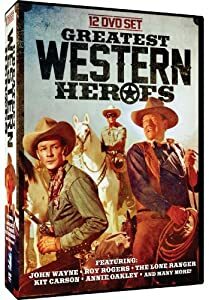 Charismatic portrayals by John Wayne, Roy Rogers, Clayton Moore, Gabby Hayes, Edgar Buchanan, and many more are wrangled into this legendary 12-DVD set! Over 67 hours of classic movie courage, toughness, and humor in the American West. Set a spell and enjoy! In black & white and color. Video/DVD, books, and audio products may be returned in exchange for the same title only. The plate is embossed and has a 12 inch by 6 inch sturdy metal frame. It also has hemmed, child safe edges. This colorful license plate will make a wonderful addition to anyone's collection. 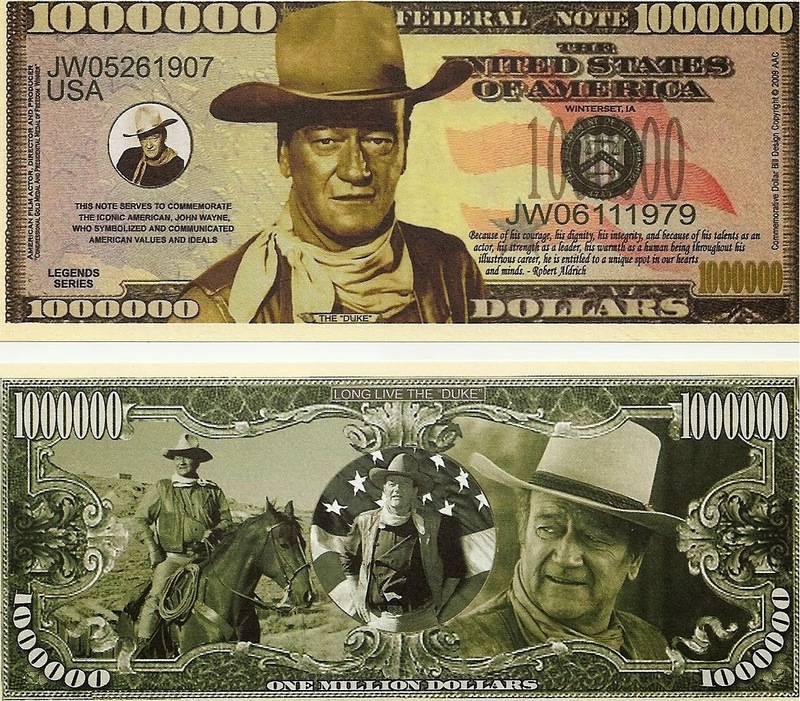 John Wayne $Million Dollar$ Novelty Bill Collectible item. These bills are the same size and feel of real money. They are finely detailed, colorful on both front and back, and have high quality printing. Makes a great gift, collectible or to framing for display. "John Wayne: The Life and Legend" is an insightful biography by Scott Eyman. John Wayne was more than just one of Hollywood's most successful actors. As he grew as an actor, he transformed into a symbol of America itself. He epitomized the genre of the Western film, which for many people epitomized America. In his political life, he identified himself with conservative causes, from the early 1930s to his passing in 1979. In doing so, he became a hero to a generation of Americans and a villain to another generation. But John Wayne had no interest in politics as a career, unlike his fellow actor Ronald Reagan. 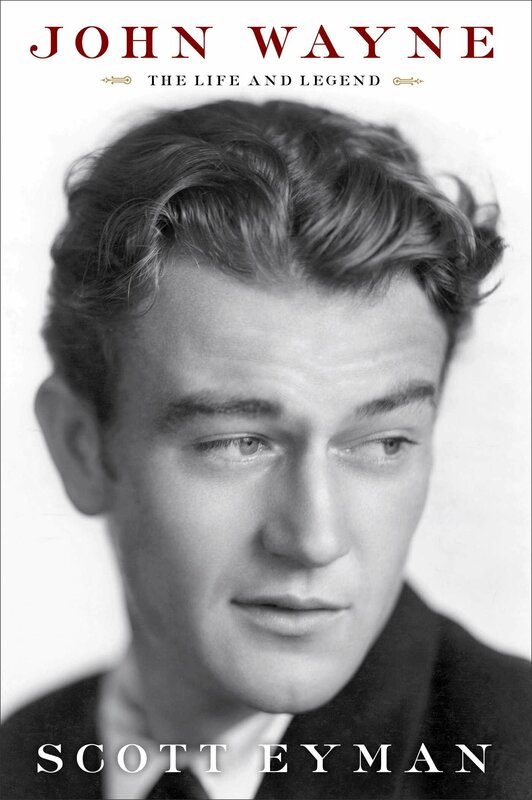 John Wayne was also like many of his fellow stars, he changed his life story, claiming to have become an actor almost by accident when in fact he had studied drama and aspired to act for most of his youth. In his love life, he married three times, each to a Latina woman, and carried out a long affair with actress Marlene Dietrich, as unlikely a romantic partner as one could imagine for him. The characters John portrayed in his films all projected dignity, integrity, and strength, even when the characters were flawed; his characters also prepared to confront injustice in their own method. More than three decades after his passing, John Wayne is still a standard by which other male actors are judged and his morally unambiguous movies continue to attract sizable audiences. 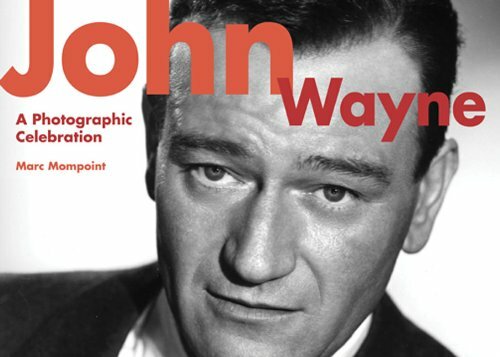 In creating this biography, author Scott Eyman interviewed John Wayne, and many of John's family members, and he has used previously unpublished information from John's friends and associates, as well as documents from John's production company to product insight on John's business affairs. Scott traces John from his childhood until he achieved stardom in the movie "Stagecoach" and dozens of movies after that. He also looks at John's relationship with director John Ford, who directed some of John Wayne's best films, including "She Wore a Yellow Ribbon", "The Quiet Man", and "The Searchers". His evaluation of Wayne himself is shrewd: a skilled actor who was reluctant to step outside his comfort zone. Wayne was self-aware; he once said, "I've played the kind of man I'd like to have been." It's that man and the real John Wayne who are brilliantly profiled in this biography. John Wayne with Lucille Ball in 1955. While this site is one of many created by Wayne McDonald of Imagine Something Worthy, LLC, it is the only site in the category of collectables. 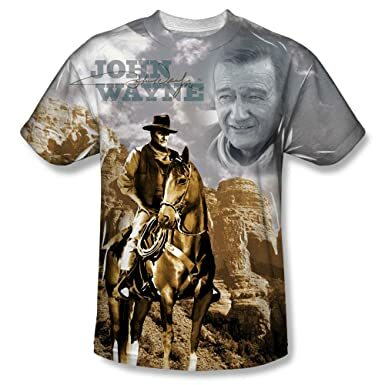 It is a tribute to John Wayne that about him are still in demand more than three decades after his passing. This collectibles site is an affiliate site. If you click through to the seller's site and purchase that product and/or others, the owner of this site will earn a commission.